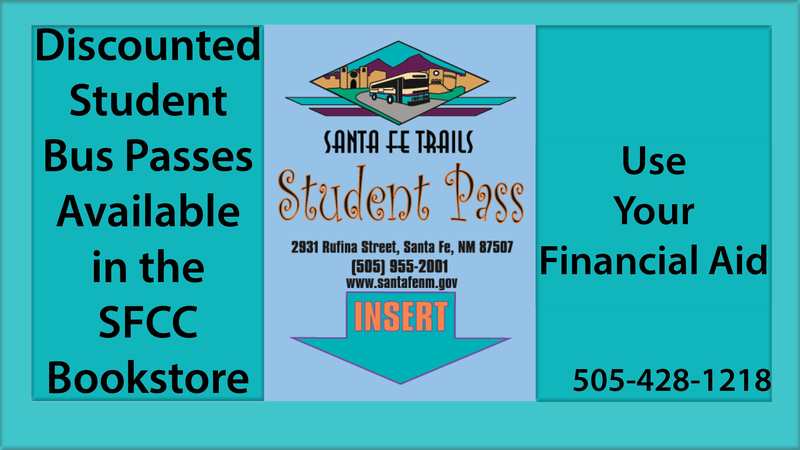 The city’s Santa Fe Trails buses provide service to and from the college from early morning through late evening. Catch the Route 21 bus from Santa Fe Place. Weekday buses run every 75 minutes. The first bus arrives at SFCC at 7:45 a.m. Last bus departs SFCC at 9:49 p.m. The SFCC bus stop is located across the street from Witter Fitness Center. No buses run to SFCC on weekends. On most holidays, buses are either closed or operate on weekend schedules. Please refer to the upcoming holiday schedule. Trip planning assistance is available. 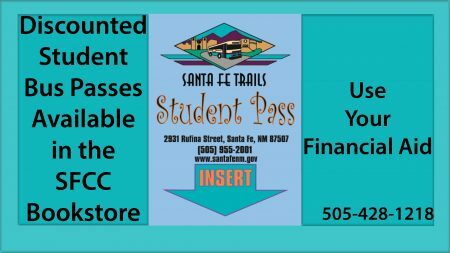 For information about routes and fares, call Santa Fe Trails at 505-955-2001 or visit the Santa Fe Trails website. The closest stop on the New Mexico Railrunner is at the NM 599 depot. Catch the Route 22 bus for a direct ride to SFCC. The bus arrives at the station at 7:23 a.m. and 8:45 a.m. See Route 22 Shuttle Schedule. Return trips from the SFCC bus stop are at 4:02 p.m. and 5:14 p.m. The RailRunner does not operate on certain holidays. Please check their holiday schedule. Santa Fe has many bike paths that, with a little creativity, will get you to SFCC. View your options at santafempo.org/documents/bikeways-map/. Carpoolers have a reserved parking area in front of the main entrance. Search for parking and carpooling information at https://www.sfcc.edu/sfcc-parking-carpool-info/. Reserved 30-minute parking spaces are available for short-term parking. Spaces with blue bags over the parking sign designate open parking. Once you’re here, SFCC’s Safety and Security Department can help with jump starts or escorts to your car after a late class. For more information, please contact the Safety and Security Office, 505-428-1224 , security@sfcc.edu.